When it comes to high-accuracy, creep-feed grinding machines, Magerle is one of the most recognizable brand names in the world. The company, which manufactures high-tech, high-precision machines, recently added a new vertical machining center and saw an immediate increase in profit. At its main manufacturing site at Fehraltorf near Zurich, Magerle AG Maschinenfabrik produces approximately 40 grinding machines a year, ranging in value from $400,000 to $3 million. Of course, the days when standard grinders were mass-produced are long gone. Today, machines are ordered individually, and custom-built to meet specific customer requirements. 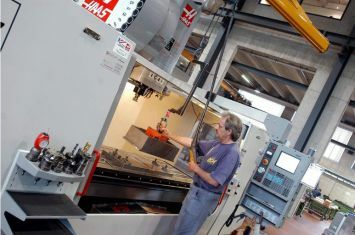 According to Magerle's works manager Angelo Ceramella, only around 60 percent of the components the company uses to build its machines are standard; the rest are purpose-designed. Increasingly, the company also undertakes turnkey projects, which not only include the grinding machine, but all of the associated workholding, tooling, automation, measurement and control systems. "We have some standard modules that form the central building blocks of the grinders," says Ceramella. "But typically, the remaining modules end up being bespoke. Although we always try to get the best use out of our standard modules, there are many reasons why each machine ends up as a unique entity. For instance, many of our customers have limited space in their factories, so we have to redesign modules." In the past, Magerle has sub-contracted many of the high-precision components it requires for its grinding machines, but this approach eventually became fraught with difficulties. "The main problem was that we didn't like being so reliant on our suppliers,"explains Ceramella. "They were able to dictate cost, and we often experienced quality problems. Worst of all, they would sometimes cost us time, which is a major problem, as we are frequently contracted to pay late-delivery penalties to our customers. Overall, we were at the mercy of our suppliers, which is not a very satisfying situation, so we decided to do something about it." Magerle had two ageing milling machines that it used for toolroom and maintenance support, and an operator who was about to retire. It seemed the perfect opportunity to sell its old machines and invest in a new machining center. 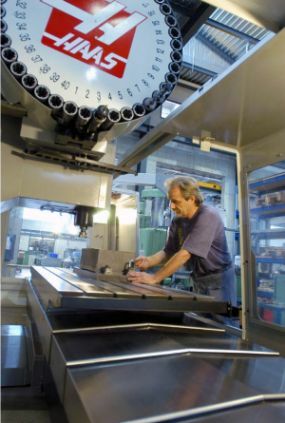 One of the suppliers Ceramella short-listed was the Haas Factory Outlet "HFO" operated by Urma, the Rupperswil-based precision tooling manufacturer, where Magerle learned about the Haas VF-7 vertical machining centre. The company's main requirements were an X-axis travel in excess of 2000mm (79"), a 40-taper spindle and an "open" design for ease of operator access. Following a demonstration of the machine, Ceramella and his team went away to consider their decision. "We thought long and hard about our selection," he says, "but the chief reason we opted for the Haas was its price-to-specification ratio. We saw many other machines of similar capability, but they were all outside of our budget." When it came to making a final decision, the process was made considerably easier by the fact that Urma uses two Magerle grinders in its precision-tooling manufacturing workshop, alongside its Haas distribution business. This alone was a sufficiently strong endorsement of the California-built machine tools. "We'd considered used machines and machines from unknown suppliers," Ceramella explains, "but when we discovered that Urma knew and trusted the Haas product so intimately, we were convinced." With a part capacity of 2134 x 813 x 762 mm (84"x32"x30"), the Haas VF-7 has ample room to handle the full gamut of Magerle's component sizes. The machine's 40-taper spindle also allows the company to continue using its existing tooling, without extra expense or problems of incompatibility. Many of Magerle's parts are manufactured from cast iron, a material that demands good machine tool rigidity, another factor, adds Ceramella, in the decision to purchase the Haas. "The Haas makes such light work of cast iron," he says, "we don't even use coolant. Overall, the machine has been fantastic," he adds. "Within a week, the VF-7 had been installed, commissioned and two operators had been trained to a level where they could both produce parts from the machine using our existing Esprit CAM software." Once toolpaths are created, they're sent via wireless transmission to the Haas, which is currently cutting metal for eight hours a day, regularly working to tenths and even hundredths of a millimeter. "At the moment, we are still learning where the accuracy boundary of the VF-7 lies. We are pushing the machine to its limit, and it's responding to all of our challenges." 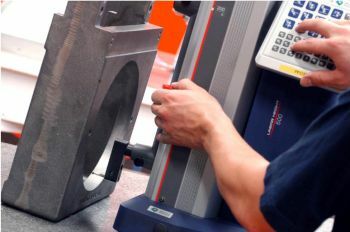 Magerle produces some of the most accurate machine tools in the world, and this means the components used to build them have to be equally as accurate. "Every day we introduce new components to the Haas, and every day it exceeds our expectations," enthuses Ceramella. "Nothing seems to be a problem. I am very happy with the machine, and so are the operators." Now that everyone is familiar with the Haas, Magerle's aim is to use it to machine as many parts as possible. "The Haas is proving to be a very cost-effective machine," says Ceramella. "As well as making us less dependent on outside suppliers, it's already having a noticeable impact on our profitability. The more we use it, the more time and money we save. We couldn't have asked for more than that."